Writing this blog has been quite an education for me. Not only have I learned much about Manila’s past but I’ve also been blessed by so many readers who have offered up their photos and stories of their families and how they’ve contributed to our beloved city. A few months ago, Javi Brias wrote and filled me in on the rich history of the Brias family, among the wealthiest and influential families of prewar Manila and of course their store, the Brias Roxas Department store that graced the Escolta for over 23 years. The family patriarch, Enrique Brias y de Coya, was born in Guadalajara, Spain and studied medicine before coming to the Philippines in the 1800s as a provincial health officer based in Negros Oriental. Eventually, his interests drew him to Manila where he ventured into business, becoming a member of the Board of Directors for the Banco Español Filipino.In the photo, Enrique Brias sits at the far left with other directors of the bank. He took the opportunity to join a young company, San Miguel, under the management of Don Pedro Pablo Roxas. Brias would eventually marry Don Pedro’s cousin, Lucina Roxas, sister of Felix Roxas, a former mayor of Manila. After the death of Don Pedro Roxas in Paris in 1913, following so soon after the deaths of principals, Don Benito Legarda and Don Gonzalo Tuazon, it was advisable to change the form of the San Miguel company from a firm of co-participants to a corporation. 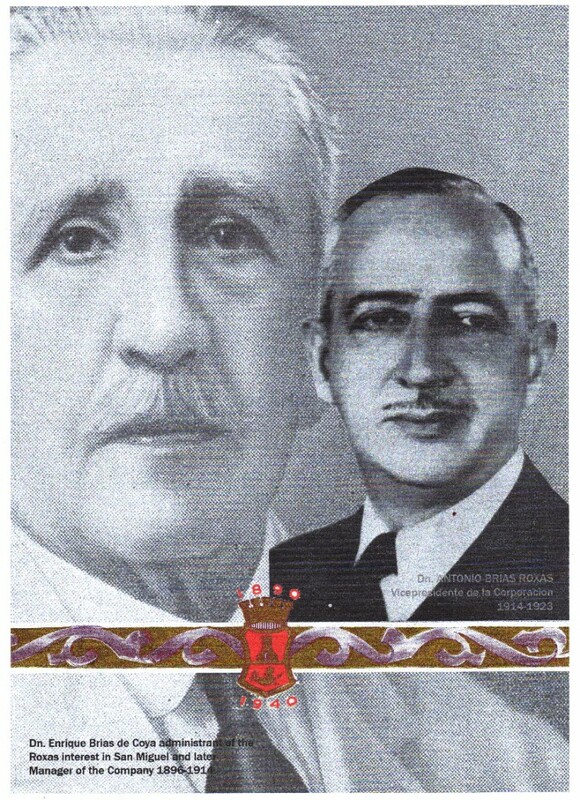 A son of Don Pedro Roxas, Don Antonio R. Roxas, was appointed president, with Don Enrique Brías de Coya and Don Ramón J. Fernández as managers. Don Enrique stayed on for a very successful year at San Miguel then retired in favor of his son, Don Antonio Brias Roxas – both are featured in the photo below. 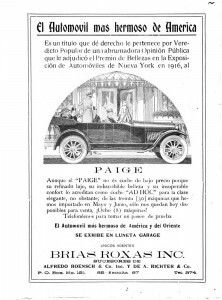 Retired but still active, Don Enrique continued his business ventures, forming a syndicate in 1918 to purchase German firms that were for sale due to the political conditions affected by the outbreak of World War I. The Brias Roxas store actually started as a merger of two well-established stores on the Escolta. 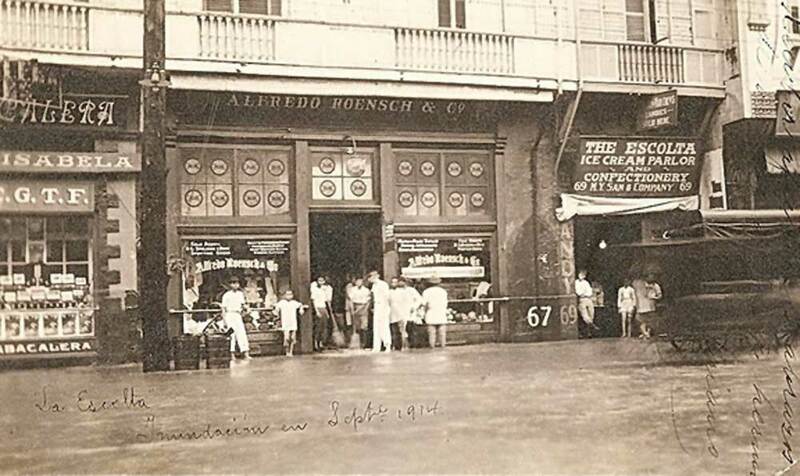 The first to be bought under these circumstances in March 1918, was the “Alfredo Roensch & Co”, a business established in 1875, and engaged primarily in manufacturing and distributing military supplies, such as caps, insignia, etc. and the importation and sale of men’s wear, arms, ammunition, and sporting goods. A month later, the syndicate acquired the business of “Adolfo Richter & Co”, established in 1877, that carried similar lines. Below, a photo of the Roensch store apparently after a recent flood around 1914. Expanding former Alfredo Roensch product lines, the new Brias Roxas store soon grew quite popular. It was a perfect location, Brias Roxas became the sole agent for A.G. Spalding Athletic Goods in 1925, in addition to adding leather goods, saddles, arms and a line of sweaters and swimsuits from Gantner & Matters, San Francisco. The newly remodeled Brias Roxas “Military Store” next to Pasaje de Paz was one of the most modern and largest department store of its day. Pasaje de Paz was an alley that extended from the Escolta past Calle San Vicente to Calle Dasmariñas. It was eliminated when the new Crystal Arcade was built. Note: to the right of the building was the Escolta Restaurant, also known as M.Y.San. 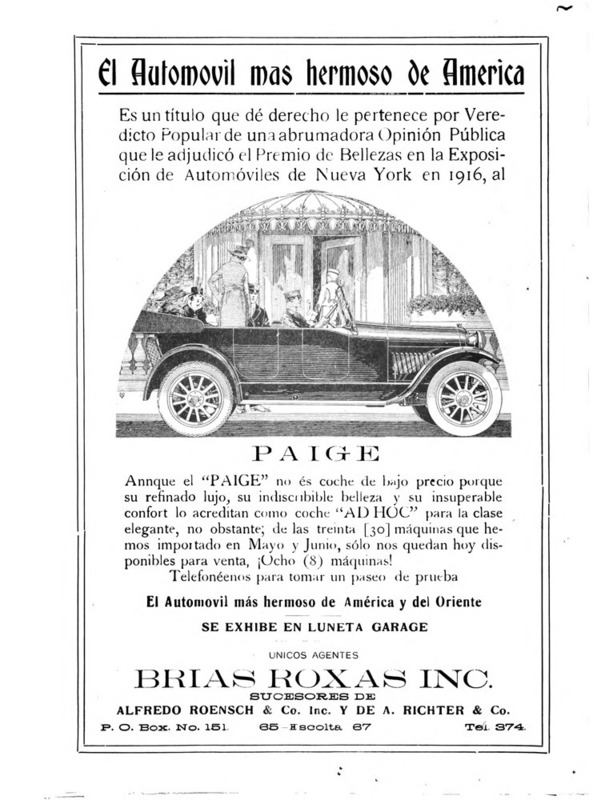 Enrique Brias Roxas, the son of Enrique Brias de Coya, took over management of the store. A new and exciting shopping/office center called the Crystal Arcade was planned to replace the aging structures that had been on the Escolta since even before the turn of the century. The art deco-styled Crystal Arcade became the highlight of Manila’s shopping district. Please check my past article on the Crystal Arcade here. Manager Enrique Brias in his office. Brias Roxas office on the upstairs floor. Enrique Brias and his staff. 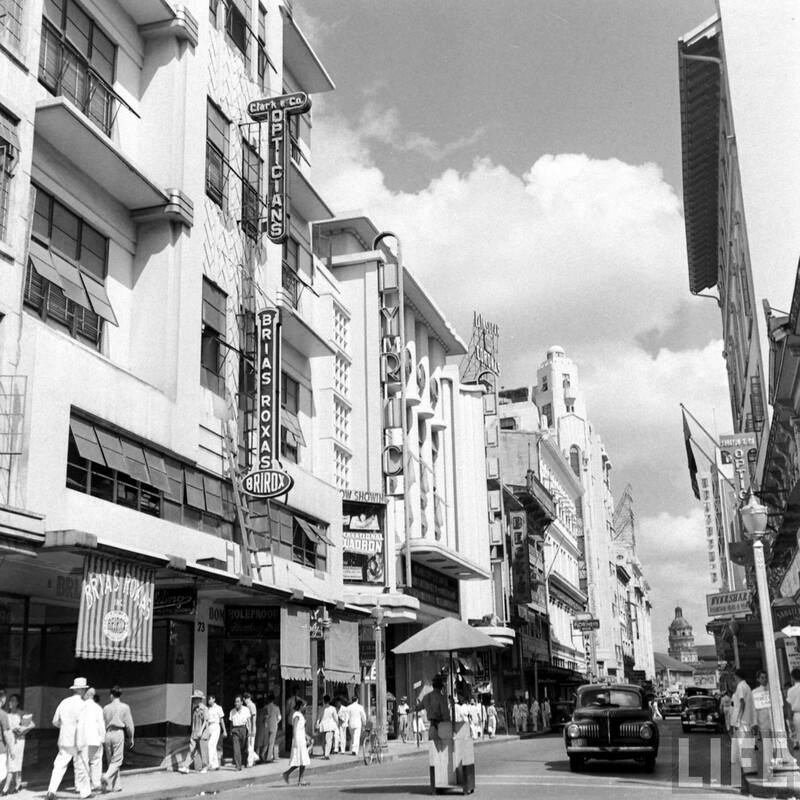 Along with the construction of the new Crystal Arcade during 1931, plans were also made to increase the Brias Roxas total store area to 1150 square meters between the Lyric Theater and the Crystal Arcade on the Escolta, and to the rear as far as San Vicente street. The old Gutierrez Building was purchased and torn down to make way for the new 4-story building. Construction started immediately for a new reinforced concrete and fire-proof building. Photo shown below taken by Carl Mydans, c.1941. 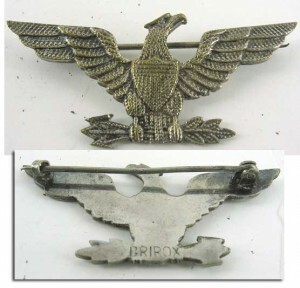 The Cap and Military Insignia business was so successful, the factory occupied part of the second floor of the second annex building. Their goods were shipped worldwide and are still being sought after on eBay and other online stores. Below – an Eagle pin with the tradename Brirox (for Brias Roxas). On the same day that Jack Dempsey arrived in Manila on China Clipper to referee Garcia-Lee championship match, Enrique Brias de Coya died at age 58 on Dec 17th, 1939. The store never reopened after the destruction of war. In that family portrait, there are actually 3 Enrique Brias. The patriarch, Enrique Brias de Coya, is the old man (my great grandfather) sitting at the center. The second is Enrique Brias Roxas (#4), son of E. de Coya and the general manager of the Brias Roxas Department Store. The last one is my dad, Enrique Brias Garchitorena, the Polo player (#5E), who is in the arms of my great grandmother, Lucina Roxas, and must have been a couple of weeks/months old when this picture was taken. So, that family portrait must have been taken sometime in August/September of 1916. As they say, stay tuned – I’ve got many more articles in store to stoke up your memories of the city we all love. Thanks for the great story, Lou. There are some facts in there I didn’t even know myself. Keep up the wonderful work! A fantastic write-up, thank you Lou. And thank you too, Javi. More power to you both! As usual a great write up on one of the premier families in the Philippines . The info on the stores ,especially the importance of the military insignia trade for the success of the business was a eye opener to me! Hats off.Lou!!! Just a very minor, nit picking sort of observation . At one point ,you refer to the family patriarch as “Don Brías”. The title or term “Don” is only used with the given Christian name. It is a compromise between familiarity and respectful distance,enabling people who would not normally be on a first name basis to address their “betters” or “superiors” by their first name. Thus we have Don Andrés,Don Manolo, Don Enrique etc etc …. but never Don Soriano, Don Elizalde or Don Brías…It can be used with a surname ONLY if the given name is also used. (the female equivalent is Doña ). I was sort of hoping that you would unearth the story of the Brías who actually become an opera singer in Europe and contributed a lot to the appreciation of the opera in the Philippines. I heard this story when I was growing up but have not been able to find a record of it ,although I was told that someone researching the Spanish in the Philippines had actually found something about this. Hi Estelle, thanks for your kind comments. I didn’t know the proper way to use the term Don. I will correct it as you suggested. Also I had not come across the Bria’s opera singer. I’ll have to do more research on that. Glad you found the article interesting. I am so very pleased you enjoyed the article and thank you for your very kind comments – especially coming from one of the family ! Thank you so much for this article. 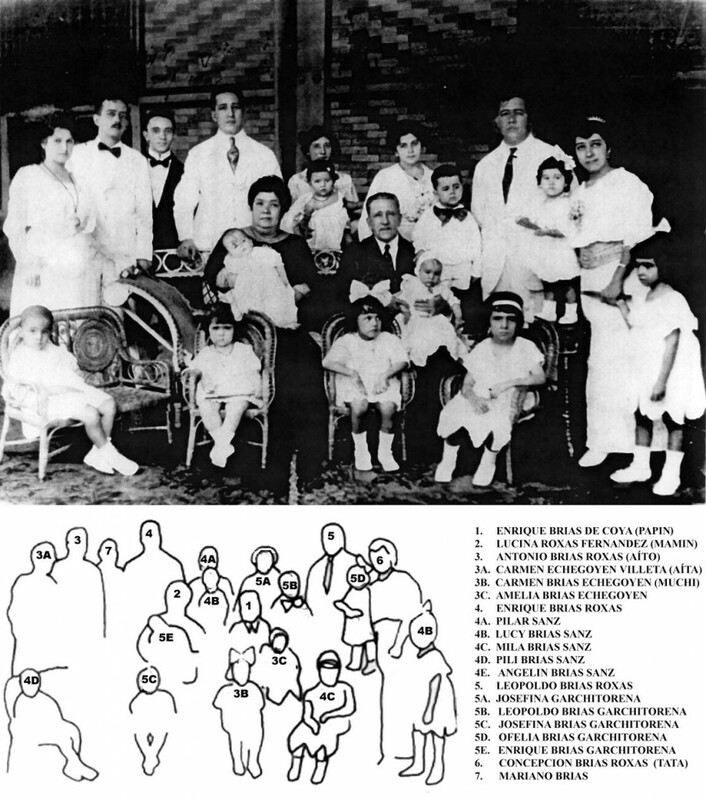 I am the granddaughter of Mariano Brias (#7 in the family picture) and the sister of J. Antonio who left an earlier comment. As my brother expressed, we lost our father at a very early age and so were raised by our grandparents. Papa (Mariano) was a great influence in our lives and our role model. He was a gentle soul and an honorable man. At 15 Mariano was sent to live in the Philippines from his native Spain. Through hard work and focus he eventually became a stockbroker and owned a seat at the Manila Stock Exchange. He never owned a car preferring to commute. Your article gave me pause and an opportunity to honor my grandfather. Thanks again. How nice of you to write, Maria. I thank you for sharing your memories of your grandfather. his life experiences. He passed away peacefully at 99. What a delightful story about your dad. Thank you for sharing it with us! Hello! I’m very impressed with this article. I’m granddaughter of Isabel Brias Llopis and I remember my grandmother talking us about her brother Mariano, who lived in Philippines. I’m looking for my ancestors to make a family history and I would contact you. My name is Berta Garcia and I live in Spain. hi mr. lou. I am not a manilena, as I am a true blue probinsyana, I come from Bataan. I don’t even think I have any relatives who have lived in Manila during these times who have made any connections with any of the people you have here in your website. What I do love reading about are recollections from the past. Philippines during the olden times really fascinate me. For me the Manila of today, Quiapo, Recto, Dapitan, these all really fascinate me and holds a deep kind of mysterious connection within me. I love Spanish era houses, that’s why during my vacation 2 years ago (i’m an OFW working in Dubai) I made it a point to see Vigan’s old houses and streets made of cobblestones. Well, that was the nearest I got to fulfilling my dream of seeing inanimate objects bringing so many of my fantasies alive. I love reading your blog sir, and looking at pictures. I am just at awe looking at them and comparing them to the Manila that is very far from the laid back one of before. I hope you can share more old photos and stories of people of Manila. take Care and God Bless. Hi Sol, yours has to be one of the nicest letters I’ve received. I am so pleased you found my articles interesting and that you enjoyed them. Thanks for making my day ! Hi! My uncle and I are trying to trace the Garchitorenas who stayed in Manila. I think your grandmother came from the Intramuros branch of the Garchitorena clan. Hope you can help us. Thank you. returned to the Philippines with her 5 children to live with her Brias Family. Hi Lou, I am the eldest granddaughter of the baby in Enrique’s lap, picture posted above. My grandmother was Amelia Brias Echegoyen. I never really knew much about the details of our illustrious ancestors, it was not really ever mentioned. In fact I do not know this part of my family at all. Curiosity made me do a google search for “Brias” and I came across your article. Thank you thank you for writing this and including pictures. This is invaluable to me. Hi Lou. The opera singer Estelle refers to would be my grandfather, Leopoldo (#5), who was married to Josefina Garchitorena (#5A). From what I’ve been told, my grandfather’s stage name was Leopoldini and had, apparently, either studied or performed in Milan’s La Scala. He died of tuberculosis at the age of 29 on a trip back from Spain. I was told he died singing Mozart’s Requiem, as depicted in a “lapida” at the family mausoleum located in North Cemetery. I think my dad was 3 years old at the time, and his eldest brother, Leo Jr., was 7. So any stories I heard about my grandfather (which weren’t many) were never first hand accounts. I know my grandmother, Josefina, later moved in with a man as she was quite young and pretty. She had a child (my dad’s half-sister) out of wedlock which in those days was a real no-no. This is also confirmed by another lapida in the mausoleum which simply reads, “Concepcion,” no last name given. She apparently died in the liberation of Manila. My dad told me he never met her but spoke to her once over the phone during the war. Great story and pictures, by the way. I had never seen many of the photos published. Thanks again for the great story. Could you please provide info on “E. P. Brias”, a Charter Member of the Philippine Islands Council, Boy Scouts of America, founded 1923 by the Rotary Club of Manila. Thanks for the reply in my email. This is such a beautiful, fascinating site. Basically, what I have been wondering about is whether Enrique Brias Roxas is the same person as E. P. Brias, or not. (If so, what’s that middle initial P?) I am trying to uncover the history of the Boy Scouts of America Philippine Islands Council (1923-1937). Just came across this article today. As always, great research and what a fascinating tale you have put together. Two things I want to add to this story: One, the house my father grew up in on what was formerly Colorado St. in Ermita (now F. Agoncillo) was next door to the Brias house. And two, you’re off by a year on the date of the Garcia-Lee middleweight title fight, for which Jack Dempsey came to Manila. It was in December 1939 — not 1940. (This is featured o my story of Luis Logan, published on http://www.positivelyfilipino.com. Thank you for the correction, Myles. I’ve edited the article to reflect 1939. Our grandaunt, Claudina Y. Nicasio (1910-1985), whose family were residents of R. Hidalgo in Quiapo during the pre-war, told us stories as we were growing up about her younger days, and always fondly recalls about her godmother, Concepcion Brias y Roxas, who she said offered to adopt her. Her grandfather, Macario Nicasio together with the Paterno brothers and Dr. Ariston Bautista was responsible for bringing an Italian Opera Company to present in 1907 “La Tosca” at the Manila Grand Opera House is Sta Cruz. We still have her memento of a ruby & diamond ring said to be a gift from the same godmother. My grandmother said she perished during the Liberation of Manila. And that she never married. Would love to know more about her.